Story #21: GC-Rich Cloning HLA Nonclassical Class I Heavy Chain (paid service). A Montreal researcher contacted us to perform the cloning of a Human Leukocyte Antigen (HLA) Heavy Chain from human genomic DNA. Firstly, in order to perform GC-Rich Cloning of their genomic sequence of interest, High-Fidelity PCR had to be optimized. Secondly, after gel extraction of the PCR product, cloning had to be performed using a topoisomerase blunt cloning kit. Subsequently, high-fidelity PCR had to be performed by colony PCR. Finally, the researcher himself would take care of DNA sequencing afterwards. To protect the research and privacy of the customer who paid for our Cloning Services, the exact name of the gene of interest and researcher are held confidential. Competitor: Q5® High-Fidelity DNA Polymerase. 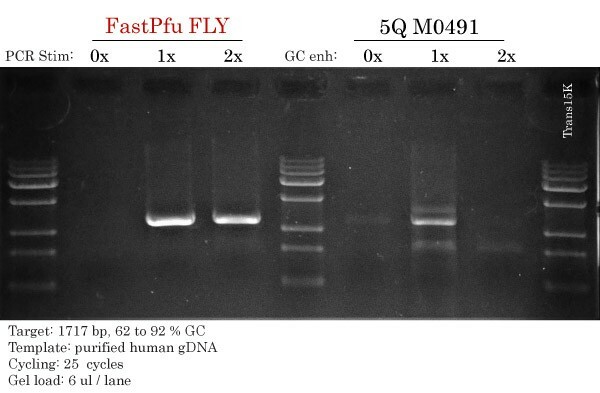 Q5® is a trademark of New England Biolabs, Inc.
High-Fidelity PCR performed with FastPfu FLY (Ultra-HiFi) DNA Polymerase. A gradient of PCR Stimulant was used to loosen the gDNA and bring down its melting temperature. PCR was optimal between a concentration of 1X and 2X of PCR Stimulant. Prior to GC-Rich Cloning, the 1.7 kb amplicon was gel extracted using the FavorPrep GEL/PCR Purification Kit. The blunt-ended purified DNA fragment was cloned with the pEASY-Blunt Zero Cloning kit. Then, 2 ul of the Topoisomerase-mediated cloning reaction was transformed into 50 ul of Trans1-T1 Phage Resistant Chemically Competent Cells. Subsequently, cells were plated on LB-agar Ampicillin plates. Colonies were picked and DNA extracted with TransDirect Animal Tissue Buffer Set. 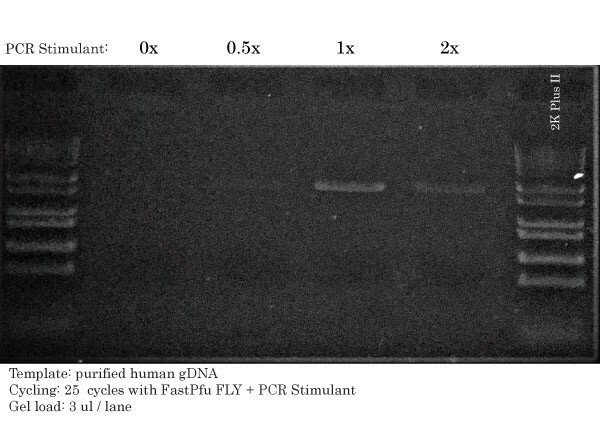 Then, High-Fidelity PCR was performed with 2x TransStart® FastPfu PCR SuperMix without any addition of PCR Stimulant, The same PCR Cycling protocol was used as with FastPfu FLY.